Edit: I have posted my photos from the event as well. As a whole, the logistics of the conference seemed to go very smoothly. When I got there Friday night, I met up with my friend David LeBer and my roomie Jose Vazquez and after checking in at the hotel, headed to TechNexus to register. My friend Eric Sinclair was holding down the registration fort. We got settled in and shortly thereafter, head organizer David Kinney set us loose on dinner. Throughout the conference, the food quality and service was very good-to-excellent, particularly considering the buffet throughput and the size of the space. No problems there. Once we finished dinner, David gave a brief welcome, thanking us for arriving and giving a brief background for anyone who wasn't familiar with the roots of SecondConf. Going into the conference, it was obvious that it was largely inspired by C4, so I was curious to see how much it called out C4 specifically. But once David's opening remarks were done, I don't recall another mention of C4. SecondConf had become its own thing. David's explanation for the naming of SecondConf was twofold -- Chicago is the Second City, and SecondConf represented a second chance for an indie conference and a second chance for many people to attend one given C4's popularity, then demise. I was curious right off the bat to see what kind of calibre of speaker SecondConf would hold for us. I knew roughly half of the slated speakers, but the conference's first, Ben Gottlieb, was known to me only in name (I've used his Twitter-OAuth-iPhone code on projects before). His talk immediately put my mind at ease, however. Ben detailed his journey from Newton to Nokia, through Palm and Pocket PC, on to the present day on Android and the iOS platform. Ben's talk was the first of three during the weekend on "the indie life" (all of which turned out to offer unique insights, not overdoing the topic), and while I was expecting more of a talk on keeping at it on your own for a long stretch of time, it was more about a personal journey through technology and how the indie landscape has changed, mostly for the better. I was very much looking forward to Brad's talk as I'd met him at C4 before and he never fails to impress. As David mentioned in his introduction, Brad is one of those guys who's always working on something that turns out down the road to be the next new hotness once everyone else catches up. Brad spoke about GPU-based processing on both the desktop and iOS. His main point was that the GPU can be used for some very fast math and that we should be making better use of it. Also, like me, Brad shares a love for the underdog in Apple's development suite, Quartz Composer. Brad highlighted QC as a prototyping tool for things like OpenCL, since you don't have to worry about all of the legwork for things like camera input, basic UI, and data exchange when you can quickly whip it up visually in QC. Brad then proceeded to blow us all away with a demo of color detection and augmented reality in QC. 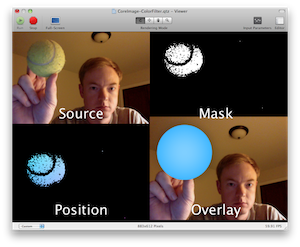 Basically, he was able to wave around a yellow ball in front of his laptop's iSight camera and produce a video of a computer-drawn proxy object overlaid on top of the yellow ball. He demonstrated how GPU processing is up to the task of realtime video frame analysis and alteration in situations where normal CPUs would be likely to choke. All the while, he was explaining this in a way that made sense to me, where previous talks I've seen on augmented reality have left me scratching my head a bit. If that wasn't enough, he proceeded to show how such technology could be ported to the iPhone, where QC isn't available. If this is your cup of tea, be sure to check out Brad's blog post on the topic. After the talks, we all headed back to the hotel to hang at the ground floor pub, Elephant & Castle. I particularly enjoyed catching up my friends Phillip Bowden and Marko Karppinen and finally meeting in person Patrick Thomson, who I'd previously only known on Twitter. Saturday kicked off back at TechNexus with some solid breakfast sandwiches and much-needed coffee before getting back into the talks. My friend Jose was first up with the second talk of the conference on the indie lifestyle. While his was also a tale of a personal journey, I was definitely struck by the warmth and authenticity that he radiated. Jose talked about making lots of mistakes, about the impact on his family, and about the trials and risks of working on technology without specific productization in mind. He said that he had spent a lot of time in Core Audio but in the end, didn't have a salable product and explained how that, mostly out of necessity, led to his app RetroSketch. This app was featured by Apple and Jose was pretty forthright with how this impacted his sales short- and long-term and quashed some common misconceptions about the latter. Brian and Ben, both of Google, gave an interesting talk on engineering leadership, which they prefer as an alternative to the dirty word management. Ben mentioned that they had given versions of this talk before (Google I/O, OSCON, etc.) but I still think it was a good fit for SecondConf. Brian talked about the Peter Principle -- that "you are promoted to your level of incompetence" -- the fact that in programming circles, once you're the company's best programmer, you tend to be promoted up to manager -- and promptly go from being the best programmer to the worst manager. Ben and Brian talked about common leadership anti-patterns -- things like trying to be everyone's friend and treating your reports as children -- as well as approaches to good leadership. They had a neat grid diagram on the various permutations of self-directed, scattered, excited, and bored programmers and how to guide people into the ideal combinations of each. I thought about the talk in the context of my own business and how I've had multiple opportunities to grow by bringing on more people besides myself, effectively going from programmer to leader. While it's still not right for me, the talk will continue to be a good resource for me whenever I come back to the topic and think it over some more in the future. First up after lunch was Anne and her excellent talk on content-driven apps. Anne is the UX lead at Inkling, which I've been meaning to read up more on since my friend Jon Wight went to work there. Anne had an excellent analysis of content apps and the thing that really sticks in my mind is her enlightening quadrant chart on the cross between customizable, fixed, designed, and sparse. Those may not be the actual terms she used (in fact, I'm pretty sure "sparse" wasn't one of them) but the idea is that you've got apps that can have a spectrum of user customization ranging from not-at-all to fully-customizable as far as layout and inclusion or exclusion of features of content. At the same time, you've also got a spectrum in design ranging from a specific design sense (something like The New York Times) to something that's more of a generic container and doesn't carry a heavily-branded feel to it. These ranges were not good or bad, per se, but rather different ways of crafting the user experience when dealing with dynamic and changing content. I'd very much look forward to seeing Anne's slides again, so I'll be sure to update if and when I can get a hold of them. Update: Here are Anne's slides in PDF form. Gene was definitely the oldest speaker of the conference and I mention that primarily because his talk was specifically about the evolution from NeXT to Mac OS X as he saw it in his lifetime and career of consulting. It was really fascinating to hear from someone who lived all of these changes, some of which date back to a time before many in the audience had been born. While I've seen the history of Interface Builder as it looked on NeXT twenty years ago, to see slide after slide of side-by-side comparison between outlets, the IB document window, inspectors, and actions one after another -- bam bam bam -- really drove the point home. It was simultaneously fascinating and scary to think how little the tools have changed in two decades of development. I was particularly struck by Gene's mention that he started life in the 1950s, a time when ham radio was one of the best outlets for someone with a programmer's mindset to hack, and how he transitioned through the 1970s and 1980s into computers. He painted a great picture of just how much life had changed in those intervening years for someone like him. Next up were the blitz talks, five-minute timed and automated presentations in the "lighting talk" style. I don't recall the exact order, but there were five talks. Kevin gave a talk on his transition from years of Emacs as a text editor to Vim. He had a good point in that people shouldn't be afraid to try new things, regardless of their unfamiliarity. And he got perhaps the greatest conference laugh ever when he featured a slide of himself next to Richard Stallman of GNU fame and declared that he was not Richard Stallman, despite the striking resemblance. Bob talked about the basic differences between the GPL and BSD-style software licenses and why you would want to use each. He sure crammed in a lot of info, and not in a bad way. At the very least, it was a great overview of how the styles differ and he made it pretty clear that BSD was likely preferred by Mac & iOS developers given the reuse flexibility. Daniel gave a heartwarming talk about applying basic financial principles like investment and "junk happens" to your non-financial life. I was especially fond of Daniel's idea to invest time in another person's life. Fantastic. Chris put on a great talk about hacking the new Apple TV, kicking off a jailbreak session on a second computer at the same time his talk started (which, by the way, got cracked before the talk was over). Chris talked about the opportunities available for some fun hacking now that the Apple TV is iOS-based. Fun talk and some cool things to think about. I first heard of Bob's work at one of the C4's. Bob specializes in something I find to be black box voodoo -- hardware accessories. Specifically, Bob talked about getting into Apple's program to build dock connector hardware accessories and then subsequently prototyping the hardware (kind of backwards from software hacking, as he pointed out). Bob got a pretty rousing Q&A going since this was such a foreign concept to a lot of software folks. All in all, it was a great complement to the software focus of the conference up to that point. After the blitz talks, the format switched back to long form talks, with my friend Colin giving the third talk on being an indie. At this point, broaching the topic yet again would get a chuckle out of the audience, but Colin definitely delivered a new and genuine take on the topic with something near and dear to my heart, freelancing, as opposed to primarily product-driven, indiehood. After four years as a wholly indie freelancer myself, I found Colin's advice on balancing multiple clients, billing hours, and managing client relationships to be spot on. Colin's talk brought to mind Andy Finnell's talk a few C4s back, where it was an introduction to the freelancing lifestyle to an audience who mostly had probably been thinking about the product route. Colin had a good Q&A afterwards, seeming to be driven by a number of people who probably hadn't considered freelancing before. All around, Colin's talk was a great addition to the conference. Speaking of good additions to the conference, Allan gave a very tech-focused talk specifically on iOS scrollviews. He showed off a technique he had to create for building a scrollview that changed orientation with the device orientation -- for example, changing from vertical scrolling to horizontal scrolling -- while potentially handling tens of thousands of subviews within memory constraints. Allan built up the app in stages, showing each as a separate Xcode project and demonstrating how the control was built incrementally. I think Allan was worried about giving a boring talk given the relative quiet of the audience, but this was partly due to intent interest and partly due to being very near the end of a twelve-hour day in the same room -- and just before dinner. Allan did a great job and it was nice to see some pure tech in the mix. Following a filling dinner of on-site Gino's East deep dish pizza, all of the long-form speakers thus far, plus Chicago-local game developer Patrick McCarron and former Apple evangelist-turned-indie developer Matt Drance, were invited up for the panel discussion. Personally, I was a little taken aback by the fact that David was only kicking the discussion off, but not really moderating during the panel. While it moved along ok, I was a little concerned that it would devolve into a free-for-all between the panel and the audience. Apparently this was kind of the idea, so once I realized this, it put my mind at ease. This is a less a criticism and just a comment. One thing I was concerned with, however, is that once the topic of the Mac App Store was brought up, there would be no going back. This is such a hot topic that I feared the entire evening would become a forum on it once it started. I'll have to go into the Mac App Store in a future blog post (thankfully, probably shorter than this one), so I won't touch on it too much here. Once we did move on from the store, I had the chance to bring up the topic of what the panelists found inspiring or exciting in tech right now. I'm kind of sad that the panel wasn't recorded for non-attendees, only because I didn't take any notes during, so a lot of it has already left my mind. But all in all, it was an enjoyable couple hours -- for myself and, I take it, for others, as most everyone stayed well over the allotted time to participate before retiring to the pub for the evening. All told, Saturday was a really packed day -- in a good way. We spent over twelve hours in the same room, feeding off of each others' energies and taking a lot in. Sunday got off to a bit of a rocky start from a personal point of view. Let's just say that on Saturday night, fun was had. But after a solid breakfast and a welcome back by David, things got underway. SparkFun believes everyone should have the tools, hardware, and resources to play with cool electronic gadgetry. SparkFun's goal is to get our hands on current technology and information and pass it on to you - we want to share the love! Chris' slides were excellent and I'm really looking forward to checking out some physical computing avenues. Chris made a point of encouraging us to think about things we already have in a hacking-oriented way -- for example, considering the flash on an iPhone 4 as a visual readout or Bluetooth chips as proximity sensors. Brian's was another talk that got its title changed, in this case from Principles of News App Development. Brian's talk really struck a chord with me. He talked about the work his team has been doing at the Chicago Tribune with open data visualizations and helping to solve social issues. While I've dabbled in open data a bit, Brian's challenge to us to think about hacking in a journalistic way really got me thinking. I've been recently thinking a lot about solving real problems with technology and not a) so-called First World Problems or b) nominal, abstract "good cause" type of tech. Perhaps I can flesh these thoughts out a bit in a future post. Suffice it to say, Brian left me with the gears turning. As a general note, one thing that did jump out at me specifically in the context of SecondConf as a whole during Brian's talk was the fact that while he spoke mainly of web technologies and sites, there was no backchannel snark going on amongst a group of largely client-side developers and designers. The opposite has happened at prior C4 conferences and, while I'm also a web guy, I was worried it might happen during this talk. But attendees seemed genuinely receptive, which I found really refreshing. Major win! I think there was a general meta-theme to Sunday at SecondConf, which was basically to mix up the preordained schedule as well as the talk names, all the while completely wowing us. 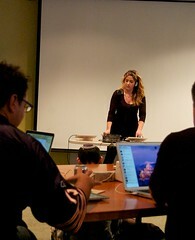 Rana's original title was The Importance of Creativity in Business, but what she really talked about (with no slides but an incredibly commanding and energetic presence) was a brief background on how she got into a dual-iPad-plus-mixer setup as a live producer and her trials and tribulations working hard to learn a new craft. Besides overwhelming me with her amazing track record, Rana quickly established a rapport with us as she opened herself up and talked about the vulnerability one can feel when trying something new. She told us how almost immediately after starting in iPad DJing, when the craft was basically in the process of being born, she'd get comments like "You're the worst iPad DJ ever! ", which got a chuckle. It seems that there is always someone who will tear you down, but that you should persevere. I am absolutely FLOORED by @ranajune's set and setup. This is the illest thing I have seen in a long time. Really, I can't express enough how amazing a closer this was. The crowd was a mix of some folks sitting on the carpet in front of Rana, storytime-style, other folks following along with rapt attention at their seats, and still others getting into a major coding groove and getting some serious work done to Rana's soundtrack. At various points, Rana would shout over the music, telling about how she was using her iPad-based tools, and at others, she would turn back to focus on particularly intense transitions. Rana's set gave out so much positive energy at the close of an overwhelmingly positive weekend. If at all possible, I'll absolutely be attending a future SecondConf. I hope that it went well financially for David and the other organizers and that it's a sustainable event. As I mentioned, there were about sixty attendees, which allowed for a good group diversity, but also at times, an intimate setting for discussion and learning. Between the amazing speakers, a solid venue with good food brought in, bright and energetic attendees, and a pleasantly crammed schedule, SecondConf was a huge win in my book.